First Close-Up Photos Of The Solar System's "Most Crazy Bonkers Comet"
In March 2004, ESA's Rosetta spacecraft left Earth in pursuit of comet 67P/Churyumov-Gerasimenko. Today, more than 10 years and four billion miles later, Rosetta became the first spacecraft in history to rendezvous with a comet. The probe is now soaring through space in tandem with its target – and the view is incredible. Rosetta is currently flying in front of the comet, mapping its gravitational fields. In the coming weeks, Rosetta will settle into 67P's orbit. It will do so at a distance of around 30 kilometers at first, but will slowly circle in closer. In November, from a projected orbital distance of just 2.5 km, Rosetta will deposit a lander on the comet's surface – all this in preparation for 67P's closest pass of the Sun in more than six years. As it swings around our parent star, the mass of ice and dust will warm, shedding bits of itself along the way; Rosetta – and Philae, the lander – will have unprecedented front row seats to the show. Rosetta's view of Comet 67P on approach Credit: ESA/Rosetta. Stunning close up detail focusing on a smooth region on the 'base' of the 'body' section of comet 67P/Churyumov-Gerasimenko. The image was taken by Rosetta's OSIRIS narrow-angle camera and downloaded today, 6 August. The image clearly shows a range of features, including boulders, craters and steep cliffs. The image was taken from a distance of 130 km and the image resolution is 2.4 metres per pixel | Photo and Caption Credit: ESA/Rosetta/MPS for OSIRIS Team MPS/UPD/LAM/IAA/SSO/INTA/UPM/DASP/IDA. Close-up detail of comet 67P/Churyumov-Gerasimenko. The image was taken by Rosetta's OSIRIS narrow-angle camera and downloaded today, 6 August. The image shows the comet's 'head' at the left of the frame, which is casting shadow onto the 'neck' and 'body' to the right. 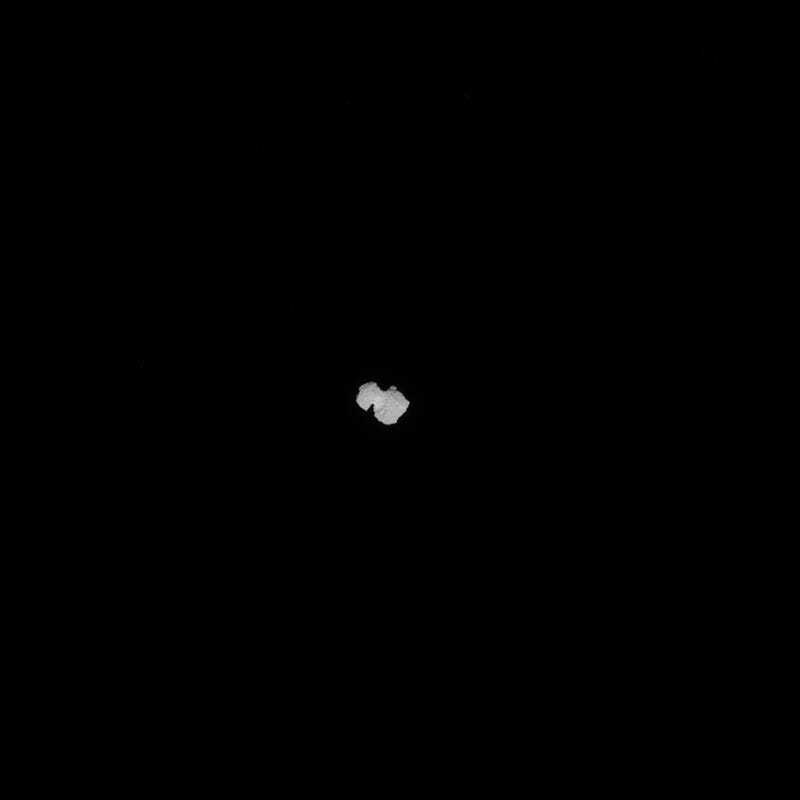 The image was taken from a distance of 120 km and the image resolution is 2.2 metres per pixel | Photo and Caption Credit: ESA/Rosetta/MPS for OSIRIS Team MPS/UPD/LAM/IAA/SSO/INTA/UPM/DASP/IDA. Comet 67P/Churyumov-Gerasimenko activity on 2 August 2014. 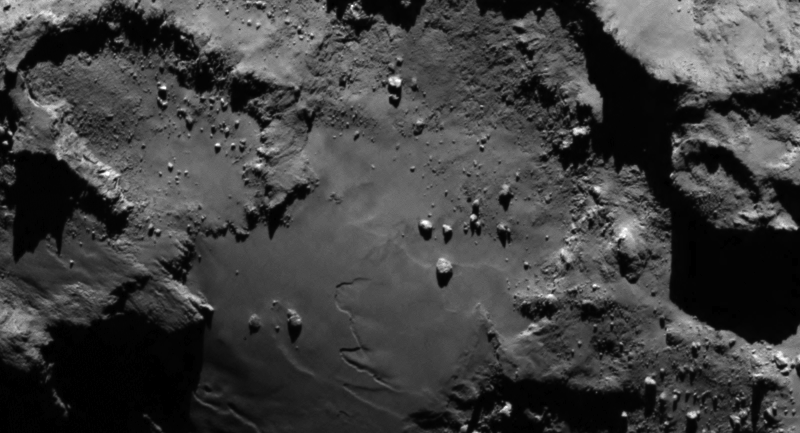 The image was taken by Rosetta's OSIRIS wide-angle camera from a distance of 550 km. The exposure time of the image was 330 seconds and the comet nucleus is saturated to bring out the detail of the comet activity. Note there is a ghost image to the right. The image resolution is 55 metres per pixel | Photo and Caption Credit: ESA/Rosetta/MPS for OSIRIS Team MPS/UPD/LAM/IAA/SSO/INTA/UPM/DASP/IDA. Comet 67P/Churyumov-Gerasimenko by Rosetta's OSIRIS narrow-angle camera on 3 August from a distance of 285 km. The image resolution is 5.3 metres/pixel | Photo and Caption Credit: ESA/Rosetta/MPS for OSIRIS Team MPS/UPD/LAM/IAA/SSO/INTA/UPM/DASP/IDA.